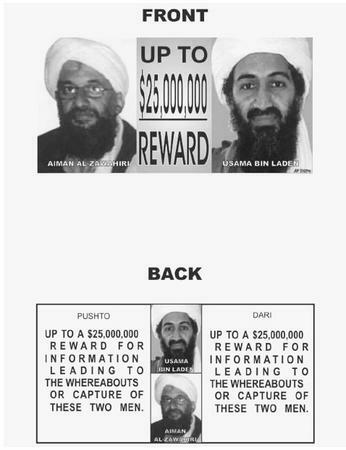 Leaflets dropped over Afganistan by the U.S. military advertising rewards of up to $25 million offered by the U.S. government for information leading to the capture of Usama bin Laden or his lieutenant Aiman al-Zawahiri. 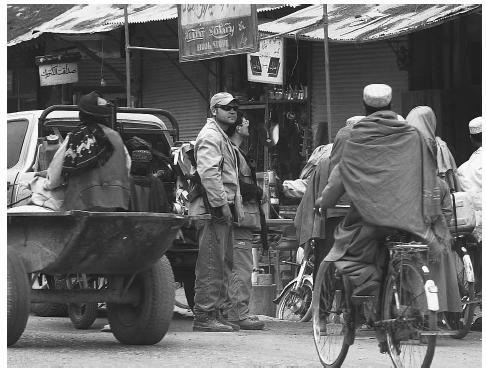 Two members of a U.S.-led covert operations team stand in front of a downtown store in Kandahar, Afganistan in March, 2002.
with much knowledge about their country's participation in covert operations, particularly during the Cold War. Some scholars have interpreted this information about covert operations as evidence of an aggressive American hand played in foreign policy, while others regard the United States as the most effective nation to bear the burden of world security and political stability. For reasons that will be discussed below, most examinations of covert operations focus almost exclusively on U.S. covert operations, undertaken most prominently by the Central Intelligence Agency (CIA). Virtually every populated region has been the target of U.S. covert operations during the postwar era. This is particularly true of places in which the ruling regime is neither unreservedly hostile, nor unequivocally friendly, to the United States. Even a hostile regime that has failed to fully consolidate its power, such as Cuba in the period 1959–61 and Iran exactly 20 years later, may provide a promising area for covert operations. Areas of focus in covert operations include the following: support, training and indoctrination, manipulation (including "dirty tricks"), and other covert activities. Support includes political advice to friendly parties, intelligence-gathering operations, monetary disbursements to individuals working in the service of U.S. interests, financial and technical help for pro-American political parties, and assistance to other private organizations such as labor unions and companies whose interests align with those of the United States. Training and indoctrination areas of activity may include the dissemination of propaganda, which often must be covert in order to be effective. (An example from the late 1970s is the proliferation of editorial pieces in western European dailies that favorably compared the U.S. neutron bomb with the Soviet SS-20.) Also under this heading is the training of individuals, groups, and forces in a variety of techniques and areas of expertize. Covert manipulation activities include economic operations, which can be designed either to destabilize the economy of a hostile power—in which case the action would qualify as a "dirty trick"—or to bolster the economy of a friendly, but unstable nation. In the same way, paramilitary or political-action groups can be used to destabilize or overthrow a regime (a "dirty trick"), or they can help to support a pro-American government. During the immediate post World War II years, the focus of covert operations was Europe—primarily in the East, but also in western nations such as France or Italy, where Communists threatened to take power, and where covert operations focused on supporting anti-Communist labor unions and parties. In the East, the focus was on destabilizing Soviet-backed regimes. CIA also backed hundreds of propaganda assets, most notably Radio Free Europe, Radio Liberty, Voice of America, and Radio Free Asia, which broadcast from the Philippines to Communist China. During the 1950s and 1960s, attention shifted to the newly emergent Third World, including Cuba, the Dominican Republic, and several nations in Central America, where Communists either tried to gain control of governments (or, in the case of Cuba, succeeded); the Congo in Africa, where the rise of Patrice Lumumba threatened to destabilize the region; and several areas in southwest Asia, most notably Iran, whose Prime Minister Mohammed Mossadegh had nationalized the Anglo-Iranian Oil Company. The Carter years. The CIA and other organizations undertook extensive covert operations during the war in Vietnam, but the late 1970s saw a sharp decline in these activities. A number of reasons influenced this change, not least among them the exposure of questionable CIA deeds that took place during the Church Committee hearings in the U.S. Senate. It could be argued that the hearings themselves were but one aspect of a larger and generalized distrust of government power that emerged in the aftermath of the 1960s, Vietnam, and Watergate. In addition, the administration of President James Earl Carter publicly favored openness in government, and reductions in American adventurism overseas. Even so, during this time, the CIA still undertook or supported, covert operations in such arenas as Angola, South Yemen, and Afghanistan, but there was unquestionably a greater emphasis on propaganda as opposed to direct action during the Carter years. Reagan and Bush years. During the 1960s and 1970s, Communists had either won control, were attempting to win control, or enjoyed the support of dozens of nations in Africa, Asia, and Latin America. At the same time, the overthrow of the Shah in Iran portended the rise of another anti-American force, that of Islamic fundamentalism. Such were the challenges facing the administration of President Ronald Reagan when it took power in 1981. Reagan responded to this situation by undertaking an array of covert operations unparalleled by that of any preceding administration. Regan stepped up covert operations and support of anti-Communist forces in Afghanistan and Angola, as well as those in El Salvador. He sought to destabilize the Vietnamese-backed Communist regime in Cambodia, as well as the Communist Sandinistas in Nicaragua. Although Reagan was particularly active in the Middle East against Iraq, Libya, and Iran, the most notorious covert operation of the Reagan years involved collusion between the CIA and the Iranian government in an arms deal that would free U.S. hostages and fund the anti-Sandinista Contras. Although the Iran-Contra scandal served to hamstring many of Reagan's more ambitious undertakings, his covert operations did not end after the scandal broke in 1987. In 1989, successor George H. W. Bush conducted military operations against Panama's dictator, General Manuel Noriega, who was captured and imprisoned. In this action, as in the Gulf War of 1991, the actual firing of shots followed a long period of covert operations. As with Carter, the last Democrat in the White House, President William J. Clinton pledged openness, and presented his as an administration that was above the practice of covert operations. This was a relatively easy claim to make, since the end of the Cold War obviated many of Reagan's and Bush's undertakings. Furthermore, like the Church Committee hearings, the Iran-Contra affair served to bring the operations of the intelligence establishment under public scrutiny. Clinton's administration, however, was one characterized by virtually unprecedented military adventurism, under a variety guises: humanitarian support in Somalia, nation-building in Haiti, and countering an aggressive, genocidal force in Bosnia and Yugoslavia. In each case, military action would have been much more difficult and costly without covert operations providing advance intelligence. Eight months into his administration, President George W. Bush declared war on terrorism soon after the terrorist attacks of September 11, 2001. The twentieth century was over, and with it both the Cold War and the post-Cold War era. The war on terror began with the bombing of Afghanistan on October 7, 2001, but by then, the CIA and other organizations had long since paved the way with extensive covert operations on the ground. Borosage, Robert, and John D. Marks. The CIA File. New York: Grossman, 1976. Knott, Stephen F. Secret and Sanctioned: Covert Operations and the American Presidency. New York: Oxford University Press, 1996. Marshall, Jonathan, Peter Dale Scott, and Jane Haapiseva-Hunter. The Iran-Contra Connection: Secret Teams and Covert Operations in the Reagan Era. Boston: South End Press, 1987. Prados, John. President's Secret Wars: CIA and Pentagon Covert Operations since World War II. New York: William Morrow, 1986.